Now that the Final Four chosen ones are known, let’s take a look at who’s hot and who’s not after almost a month of tournament. How can you make people forget you had 7tos? Well, try the 17th triple double in the NCAA tournament with 17pts on 5/9 (2/2 from three), 11rbds and 17as !! 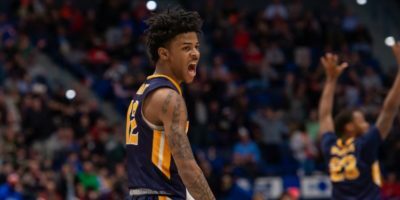 In two games, Morant has been awesome, at the point that he might be the first player called on draft night. In the second round against a physical team of FSU, Morant struggled to finish in the paint with 3/15 (5/6 from three) but still was able to record 28pts 5rbds 4as and only 2tos. His incredible passing, spectacular athleticism and the fact that he’s improved so much from three make him at least a top three pick and potentially the number pick above Zion. After a slow start against Fairleigh Dickinson with 12pts 8rbds 3as, Clarke exploded against Baylor with 36pts on 15/18 8rbds 5bl, displaying his outsanding athleticism. He was also impressive against FSU big boys with 15pts 12rbds 5bl before the loss against texas Tech where he was the team leader with 18pts 12rbds 2bl despite his 6tos. While he’s considered undersized and lacks the ability to shoot efficiently from outside, Clarke’s dynamic athleticism and defense are way too good to ignore. He might have jumped from the late first to the mid first round with his perfs and might even hear his name earlier. One of the main reasons Virginia is stil contending for the NCAA title, Jerome may not have the impressive athleticism of some of the other prospects but damn can he play. Before the Elite Eight game against Purdue, he averaged 12.7pts 5as 2.7st with a combined 7/17 from three as UVA kept its opponents under 57pts. As Purdue pushed the tempo to beat the Cavaliers, Jerome stepped up with 24pts 7as 5rbds for only one to. He did all that while playing 45min that night, good for 40.2min per game over the tournament (sic). A nice passer and efficient outside shooter with length at his size, it wouldn’t be surprising that he be drafted in the 20s if UVA keeps winning. Limited the whole year to less than 20min by Roy Williams, Little did the best of it against Iona and Washington. In these two games, the UNC freshman averaged 19.5pts and 5.5rbds in 19min, proving he was not overrated. Victim of flu like syndroms against Auburn, he was limited to 13min and couldn’t bring his usual toughness. Little is far from being a finished product and has ways to go to used his length and athleticism on defense (2bl and 2st in his last five games). Yet, he at least displayed why he was a top 5 prospect entering this year. Poor Okeke !! While he stepped his game as the Tigers were advancing in the tournament, he suffered a terrible torn ACL which will prevent him from playing the Final Four and being healthy for the draft. After an average game (13pts on 3/9 5rbds 3st) against New Mexico State where UVA won thanks to missed FTs from the Aggies at the buzzer, Okeke was a bit better against Kansas with 12pts on 4/10 5rbds 4as and 4st. He did even better against UNC with 20pts 11rbds 2as 2st in what could be his last college game. What makes him special is, as a stretch four, his defensive upside (1bl and 3st per game in the tournament) combined with his ability to shoot from outside (12/24 in four games), strengths which should be enough to guarantee him a first round pick despite his injury. Winston is the heart and soul of the Spartans. The 6-0 PG had already been good against Bradley (26pts 4as), Minnesota (13pts 9as) and LSU (17pts 8as) but the matchup against Duke was the ultimate scene for to perform. Against a pesky defender in Tre Jones, Winston had 20pts (albeit on a poor 9/23) 10as and 4st for only one to. In a draft weak in point guards, he could be in the discussion for a late first pick despite his physical limitations. Brunson was in the same position with Villanova last year and has been a nice surprise for the Mavericks. A good example to follow for Winston. As a projected number one, hard to put Zion in another category. Truth is I may be harsh on him. Despite his impressive tournament with averages of 26pts 8.5rbds, Williamson struggled a bit more against physicality with 50% FG against UCF and 52% against MSU. In that last game, playing against the big boys from Lansing, Williamson relied on his ability to drive but in the low post, he was trapped everytime he put the ball on the floor with his left hand. He needs to work on being as consistent with his right hand as he is with his left and work on some real post moves because he won’t be as dominant against NBA players as he is against college boys. While Culver has been leading his Red Raiders to the first Final Four of their history with 21.7pts 6.7rbds and 4.5as, his shooting is still very streaky, a bad point for a SG. Over his last threee games, the probable top ten pick recorded 3/17 from three and had two very bad games offensively where he shot 35% and 26% FG against Buffalo and Gonzaga respectively. With no clear order behind the top three, Culver may hear his name very early but his inability to shoot consistently at the SG spot kind of hinders his upside. Like Culver, Barrett’s stats are pretty impressive with 20.2pts 8rbds and 6as over four games. Yet, he needs to work on two main aspects of his game. First of all, refining his shot selection and finishes around the rim as the Canadian only averaged a notch above 40% from the field in the last three games including 36% from three (Mostly due to a terrible 0/7 against Virginia Tech). Next thing Barrett has to work on is tightening his handles and passing as his turnover numbers improved with the level of the opponents’ defense. After recording 5tos against VT, he did even worse with 7 against MSU, far too much. Contrary to some observers, I’m not worried about his NBA potential as Barrett also displayed very good passing instinct with 6as per game in the tournament. His missed FT will not make us forget how he carried Duke andtook the responsability when needed. Put aside the first round against Gardner-Webb, Hunter has been more than disappointing. 10.3pts 4rbds 1as 0.7st in more than 35min per game is not what you expect from a player with his size, athleticism and overall skills. Moreover, he shot a poor 37% from the field including 3/12 from three, a supposed strength. Hunter still has the Final Four to prove he can perform on the big stage but his stock may have already slipped. The Hokies were not far from eliminating Duke and NAW may have a big responsability in this setback. After a nice first round with 20pts on 61% FG, the Canadian struggled against Liberty with a terrible 2/8 from the floor which he makes up for with 6as and 6rbds. Against Duke, NAW shot 3/10 including 1/5 from three and had 3tos for 5as. The failure of other top ten prospects may not affect NAW’s stock that much but he will need to work on his strength around the rim and shooting consistency, which was supposed to be his forte. With 21pts and 8rnds against Fairleigh Dickinson in the first round, Hachimura had bounced back well from his poor perf in the WCC final against St Mary’s (9pts 5rbds in 34min). Yet, his potential three last games in college exposed him as a tweener. Contrary to his teammate Clarke who has high blocks and offensive efficiency numbers, Hachimura doesn’t have any special strength. Not a good a shooter enough, he recorded 0/4 from three in the tournament. A good but not elite athlete who lacks the strength and length to play as a pure PF, he only grabbed 15rbds in his three last games and averaged 16/38 inside the 3pt line. He still has this ability to draw fouls as evidenced by his 17 FT attempts over the last two games but he may better suited as a combo forward coming from the bench than a potential starter right now. Propelled to the top 10 in some mocks due to his scoring numbers as a freshman and the lack of PGs, White actually displayed the same inconsistency he played with the whole year (15 games under 40% FG). The UNC leader had two out of three games with less than 30% FG including a 4/15 on 0/7 from three against Auburn. He limited the damage with a good 5tos combined but wasn’t much of a creator for his teammates with 10as. White needs to find the ceiling he will reach every game to be consistent as he’s not the purest passer you will find. Next Next post: Final Four preview : Will MSU prevent TT, UVA or Auburn from winning their first title ?